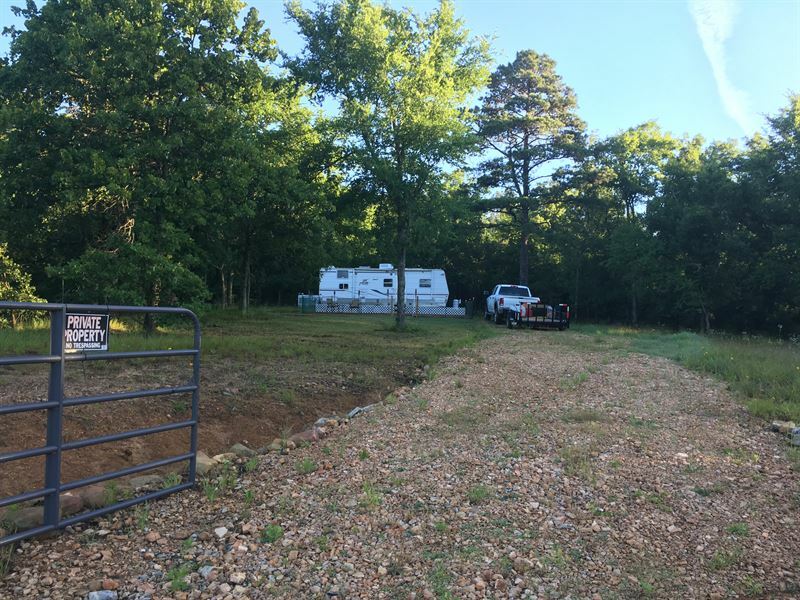 Beautiful secluded mountain property on well maintain maintained county road in the Jack's Fork of the Kiamichi Mountains of Southeastern Oklahoma. Legally Surveyed Into 5.91 Acres +/- with survey pins in place with 390' +/- of gravel road frontage on Burris Valley Road along the Southern boundary. Ideal For family gatherings, hunting, camping and all types of outdoor recreation. Covered with pines, oaks, and black walnut. The land is rolling mountain land with interesting rock formations. There are several nice building spots with one acre and a half already cleared, leveled, and built up. There is a RV pad and 200 foot crushed rock driveway in place. No utilities are currently on the property although power is available. 600 gallon concrete cistern on the property fed by a natural year round fresh water spring. Deer, Bobcat, Mountain Lion, Bear, Raccoons, Rabbits, Squirrels, Armadillos, and an occasional group of Wild Hogs and various birds including Owl, Hawk, and Turkey. The price includes 3- 275 gallon water tanks, 8X10 storage shed, 20X30 foot fenced yard with 10X30 foot wooden deck, and a 16 foot driveway gate. Currently at the property and available at additional cost--2007 Puma fully self contained 31 foot trailer, 20 foot steel Shipping Container, 2016 Ranger ETX side by side 4 wheeler with a 2016 14 foot Maxx Utility Trailer, 2016 Craftsman 46 Inch riding mower, 2 watt Champion generator, 2 watt Predator generator, older 16 inch Craftsman chain saw, 2017 18 inch Husqvarna chain saw, 2017 Predator Wood Chipper, and various other tools. Nice Set Up And An Excellent Place To Enjoy Time Away with family and friends. Owner is moving from Dallas/Fort Worth area and will accept a reasonable offer for entire package or parts of the package.